Perfect for all of your kitchen's heavy duty serving and cooking needs, this Vollrath Jacob's Pride 47146 #30 black disher provides accurate 2 tbs. portions of hot or cold foods in your restaurant, cafeteria, or bakery! The color-coded handle helps ensure easy size identification when selecting your desired serving amount of mashed potatoes, steamed vegetables, yogurt, cookie dough, and other soft foods. I bake professionally and this size is my 'go to' for cookies. Slightly smaller than what you might want in a retail cookie, but that's the size I need. When I am scooping cookies for home or parties, or gifts, I fill the scoop a little under level for a perfectly acceptable-sized cookie that is not too huge or skimpy. I purchased every other brand before buying these for my ice cream business since these were more expensive. All the others broke in no time -even the Hamilton Beach brand. These have held up well with daily use and I’ve only had a problem with a few where the scraper/blade inside the scoop doesn’t go all the way around the scoop part so it won’t push the ice cream all the way out. Good quality scooper. It hasn't seen as much action as my others, but it is holding up well. I would order more of these 1oz scoopers if I needed to, considering how infrequently I use them. For my more important scoop sizes, I would probably order a higher quality. I bought a couple of cheaper dishers off this site a few years ago, and while the #16 worked just fine for loose batters like muffins, my old #30 just wasn't robust enough to scoop and release stiff, refrigerated cookie dough. I'm much happier with the Jacob's Pride version. Just love these scoops! This size is great for my average cookie. Easy to use, easy grip and release and easy to clean! Works for me! This 1 oz. scoop is the perfect size for thick delicious cookies, and great quality to stand up to the most dense cookie doughs giving you a great uniform size every time. These scoopers get the job done. The only downside to these is that there is no clear size markings on the actual scooper. They use this weird number system, and as a business owner i have enough to do= the last thing i want to have to do is memorize their number system and how it matches up with portions. Nice scoop with plastic handle. Great for portioning cookie dough, or to scoop prepared salads, etc. We use these scoops in all areas of the kitchen - highly recommended! I love these scoops or dishers. They are strong and last forever. I've had the same set for years. I drilled a hile in the handle for hanging. While we have purchased all of the Vollrath dishers due to ease of use and cleanability, this one is our kitchen workhorse for making cookies. Perfect. LOVE! LOVE! LOVE! THIS SCOOP! This is probably one of my favorites for cookies. Not to big. Not too small. also a good disher size for portion control with various foods. But. This is a great size for cookies... A WINNER! I bought this to scoop cookies but it has come in handy for so many other things. Portioning out potato, chicken, and tuna salad has been a breeze with this scoop. I really needed a great quality disher that would withstand a lot of use and this product has given me what I needed. It is a very sturdy and proportionately reliable scooper that will last. Offers great portion control while also having a solid design and easy grip. These are much higher quality for commercial applications. Just what I needed. Great product at a fair price. Would definitely order again. This gets heavy use scooping Italian Ices. I highly recommend it. You pay for what you get. A quality product from a trusted brand. I expect this will last a long time. So far no issues and the handle hasn't cracked like the cheaper brands do. Another great "disher" or scooper. I currently use the 1 oz. disher for portioning out cookie dough. I have also used to fill mini loaf pans and mini muffin tins for perfect sized results every time. 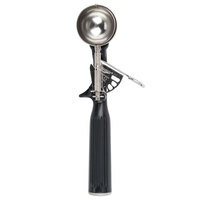 This is my overall review for this great product: Purchased a similar "disher" at a nearby specialty cooking store for double the price and within a couple of uses it was falling apart. After that disaster purchase I purchased most of the Vollrath Jacob's Price dishers (several sizes available) and haven't looked back. They work every time and don't fall apart. They are designed for heavy volume kitchens and can take a beating. Skip the more expensive versions at the specialty cooking stores! This I used for ice cream, not your average ice cream scoops but gets the job done and perfect for yogurt or fruits. These will surely come in handy. Much more heavy duty than I pictured. Not one I would use for general serving but for portion control when cooking or baking this is the one to go with. This disher (scoop) is a staple item in foodservice. It holds up well after repeated use and abuse. Great quality, amazing price and as always immediate shipment. Thank you! I ordered 4 more of these 1 oz scoops as they are the perfect size for me and my Italian Ice Business. I use one scoop per flavor. I use this scoop for quickly measuring out scoop cookies onto my pans. It's really easy to use and gets all of the batter out so I know I've gotten the right amount for each cookie. Scooping made easy!! This quality is unbeatable. I've had a few. I need one in every size of this brand. I love using them. They make scooping a breeze. This 1 oz disher works for my needs. I use it to scoop malleable coconut oil into my popcorn kettle. Before this, I was using a spoon, and it was difficult to get the coconut oil to stop sticking to the metal surface. This product solves that problem and has been saving me a lot of time and effort. Also, the 1oz size allows me to control portions a lot easier. Love the Vollrath dishers for all types of portion control in the business where I work. You know exactly how much you are serving or dishing up. I use the 1oz all the time to make cookies by the hundreds. Heavy duty scoop. I use it for cookies and meatballs. I make a lot of cookies and this scoop has held up very well. I have broken several lesser quality scoops. I'm glad I found this brand! We use these dishers for portioning toppings in the ice cream shop. I have always been impressed with Vollrath quality and durability compared to some the the other less expensive options. I got a couple of the Vollrath dishers and love them. I use this particular size for meatballs and smaller cookies. Very heavy duty and priced very well here at webstaurant. Vollrath provides a wide range of dishers and are indicated by different colored handles so the user knows how much each handle measures. We have a red handle disher just like the 1 oz black and it hasn't failed us. We know the exact amount that will be used in each application which helps with consistency. Without a doubt, Vollrath makes the best dishers, The #30 is a great size for meatballs. Excellent quality and an excellent value. Highly recommended! Five stars! This is a great little scoop! Did you know that it has a lifetime warranty on it too!? My handle started to crack, I called and they are sending me a new one! Great customer service! This is a great product! It is heavy duty and comfortable to use. It makes the perfect size cookies. I even use it for meatballs. Love it! Great product. Haven't had one thats broken, unlike other brands, and we use them daily. Our team highly recommends this item for efficiency and durability. These disher's are awesome, we use them all over the restaurant for portion control and they save tons of money, great quality and very reasonable price!!! Perfect little scoops for small meatballs or what have you. And they're sturdy and feel like they should stand up to a lot of abuse. Working good for me so far. This one once scoop is great and will hold up to years of use. I use this size to scoop cookie dough. With this scoop you'll get the perfect size every time. I like these for my sandwich shop. I use them to portion 1 oz scoops of tuna salad on to my sandwiches. Also great for portioning out other semi solid foods etc. Great scoop and great price. We have been using the same portion scoop on a weekly basis for almost 4 years now without any problems. Very well made perfect size if making big batches of cookies! Will recommend these and will order again, Websaturant has fast shipping and excellent customer service! We use these for so many different kitchen task in our kitchen. You can use them for bigger size truffles of simply scoop out your favorite ice cream. This #30 is great for small cookies, small scoops of ice cream or sorbet, or small muffins. I'd use this to fill my mini muffins everyday. Great Product! This is the perfect disher for the cake pops I make in my cafe. It scoops and releases the cake very easily and in uniform balls. I have ordered all sizes, and have a color for each bakery item. I bought some more expensive dishers, but the were difficult to use and started to rust. This Vollrath black disher is my favorite one. It looks sleek and solid, and works very smoothly. I use it mostly for dishing small portions of ice cream. This is a great utensil to have for someone who is on a diet, because small portions are important when you want to lose weight. You can't find the disher of this quality in retail or department stores.